At Ollie's last well-baby check-up when his pediatrician looked in his mouth, he asked, "Are you brushing your teeth regularly?" Thankfully, Ollie said, Yes! In my mind I was answering, Um... well... we try too! The truth is, sometimes, brushing my toddler's teeth is harder than brushing a dog's. When he is not in the mood to have his teeth brushed, he'll squirm and shake his head, or close his mouth in protest. Even when he's down for brushing his teeth, it can still be an impossible task. Especially getting his top back teeth. Apparently, I miss and tickle the roof of his mouth. 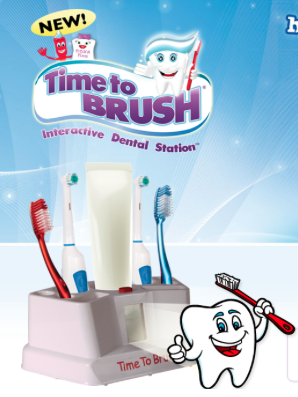 So, when the inventor of a teaching tool to help kids learn to brush their teeth, Time To Brush, reached out for a review, I was all for it. Please, help me teach my toddler to stop sucking down toothpaste and start brushing with it. You all, this thing is really great! And surprisingly, really effective! Check out Ollie putting Time To Brush to the test! Something that I really like about Time to Brush, is watching the progression of Ollie learning to brush his teeth. He really likes following along, and the encouragement he gets along the way is awesome. After a week of using The Interactive Dental Station daily, he is better at brush placement, and maneuvering it in his mouth. I LOVE it! At at $20, I'd say it's worth it for sure. Another great feature is that the system can be played in English, Spanish or French. I can't tell you how many times I've been freaked out by a French or Spanish voice talking in my house. Since Ollie thinks it's a toy more than a teaching tool, he's always wanting to play with it. For now, I don't see the harm. The more he loves to brush his teeth the better! 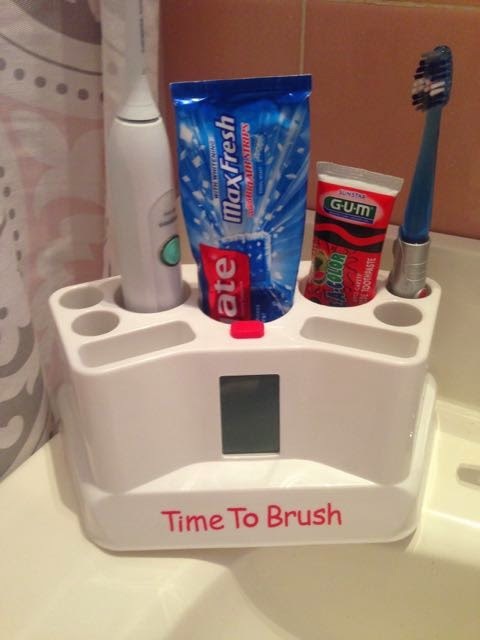 To get you hands on a Time To Brush Station Now, Click here!